London photographer Tom Johnson's latest exhibition Outside In explores the city from an outsider perspective. Based in Shoreditch, the twenty two year old shoots a mix of fashion, documentary and portraits, with Outside In his second exhibition following last year's Another Britain. Exposing the contradictions, isolations and intimacies of London life, Johnson cherry picks the best of what's weird and wonderful about London. Ahead of the show's opening today at Box Studio, Dazed talks to Johnson about capturing the often daunting isolation of city life and why photographing strangers is so rewarding. Dazed Digital: How would you describe London from an outsider's perspective? Tom Johnson: The pace of life is about as different as it could possibly be from the village I grew up in. Right on my doorstep here in London there’s no end of new experiences to be had. It can be daunting but there is so much potential. At the same time, though, people can still be isolated in their own way in the city. DD: Is there a photo from this series which particularly encapsulates London for you? Tom Johnson: None of the photographs are trying to encapsulate London in themselves. The series as a whole is about diversity. Even then I am only documenting my own personal experiences. DD: Your last exhibition Another Britain was also concerned with documenting city life - what is it that most attracts you to this type of photography? Tom Johnson: London is a city of contradictions in as much as everyone is so closely connected but people are still isolated. Day to day interactions are normally rushed and impersonal. So I am keen to break this in my work. Photographing strangers to me is as exciting as it is unpredictable. You can’t control the reaction but when it works it can be really rewarding. DD: Can you tell us a bit more about the backstory behind the portrait of the body builder and how that shot came about? 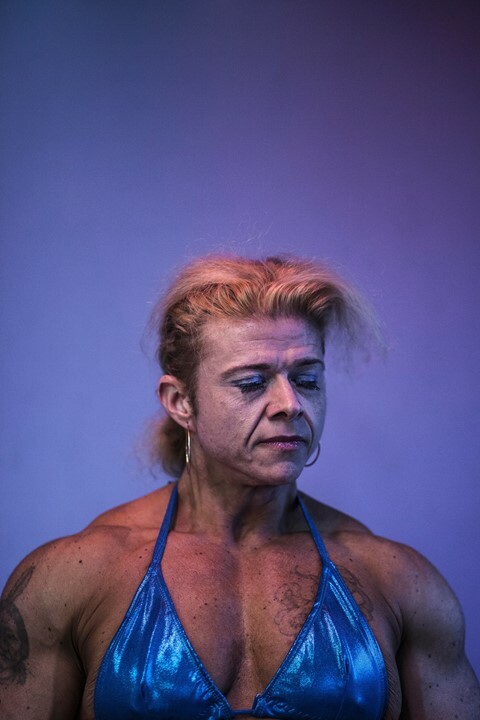 Tom Johnson: I wanted to photograph people that were visually interesting, I had a couple of subjects in mind that I wanted to meet and I stumbled across her - she is a World Champion in bodybuilding. I contacted her and spent the day with her. This was the same with a few of the portraits. I wanted to photograph people with lifestyles or interests that were unfamiliar to me. DD: The series seems to have quite an isolated kind of vibe, is that an intentional by-product of the portrait style do you think? Tom Johnson: Yes, I wanted to bring the people who normally blur into the bustle of city life into focus. Some of the compositions do emphasise this, I'm trying to capture an intimate moment often in the least intimate situations. DD: How did you go about selecting your subjects for each portrait? Were a lot of them just spontaneous shots? Tom Johnson: Some of the shots were spontaneous encounters on the street yes, but for some I was able to meet through a chain of connections or online. DD: What's next for you project wise? Anything on your bucket list for 2014? Tom Johnson: I'm working from my studio in East London on various editorial and fashion work while working on a few longer term projects. In particular I'm pursuing an embed with the London Fire Brigade for Part II of my project ‘Another Britain’. Outside In opens at Box Studio today and runs until Sunday 2 March.